For other uses, see Karim (disambiguation). 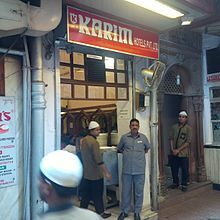 Karim's Hotel or Karim's is a historic restaurant located near Jama Masjid, Gali Kababian, Old Delhi, Delhi, India. Established in 1913, the restaurant has been described as "synonymous with this area" (Old Delhi) and "arguably the city's most famous culinary destination". 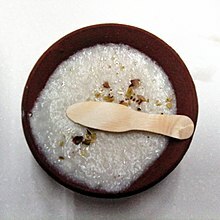 In mid 19th century, Mohammed Aziz was a cook in the royal court of Mughal Emperor, however after the Bahadur Shah Zafar was exiled, he left the city for Meerut and later Ghaziabad. However, in 1911, when Delhi Durbar was held for the coronation of the King George V, one of Aziz's son Haji Karimuddin moved back to Delhi with an innovative idea of opening a Dhaba to cater the people coming from all over India to join the coronation. Haji Karimuddin started the Dhaba selling just two items of Alu gosht (mutton with potatoes) and Daal (lentil curry) served with Rumali Roti. In 1913, Haji Karimuddin established the Karim Hotel in Gali Kababian, near Jama Masjid, Delhi saying, "I want to earn fame and money by serving the royal food to the common man". The restaurants opened its first branch in 1990s in Nizamuddin West, followed by Kailash Colony, Noida, Gurgaon and at Kamla Nagar, all in Delhi NCR region. Today, the fourth generation is running the show with Karim Hotels Pvt. Ltd. at Jama Masjid, a Restaurant called Dastar Khwan-E-Karim at Nizamuddin West New Delhi . ^ India. Lonely Planet. 2001. p. 158. ISBN 9781864503289. ^ DK Eyewitness Top 10 Travel Guide: Delhi. Dorling Kindersley. 2012. p. 65. ISBN 9781409387008. ^ Andrew Buncombe (28 April 2013). "Fit for an emperor: Old Delhi's most enduring restaurant Karim's celebrates its centenary". The Independent. Retrieved 24 August 2014. ^ "Karim's -- a non-vegetarians's delight!". Rediff.com. 2 September 2005. Retrieved 24 August 2014.